Happy New Year! I hope everyone had a safe and FUN holiday! I know I did! Even though it was super cold over Christmas (I’m talking Northern New England kind of cold) it was beautiful and the skiing was great! Now that the holiday rush is over… everyone is SICK! Turns out that flu shot you got this year was the wrong strain of flu and now you’re screwed (and sick as a dog). So between the cold weather and all my friends being sick, I thought it would be nice to make some feel better soup!! 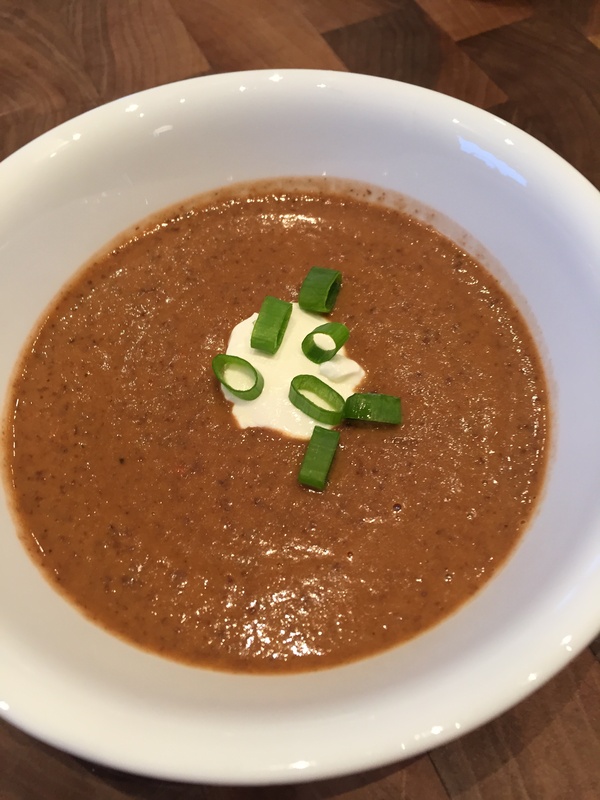 This black bean soup recipe is one of my favorites. It’s so easy and its ready in no time. A few other bonuses… its vegan (shhhh don’t tell anyone because they won’t be able to tell, its so delicious!!!) it’s dairy free (if you’re crazy enough to leave off the dollop of sour cream) its gluten free and its filling! Seriously, this soup is a meal on its own! So if you’re feeling a little under the weather, throw on a pot of this soup, you’ll be enjoying it in no time!! Cheers to 2015! Heat oil in a large heavy stock pot over medium heat. Add onion, bell pepper and garlic and saute until onion is translucent, about 10 minutes. Mix in tomatoes with their juices, chilies, and thyme. Reduce heat to low and simmer until vegetables are very soft, about 10 minutes more. Add beans and 2 cups of broth. Puree soup in batches or using an immersion blender, blend until smooth. Return soup to pot and bring to a simmer. Thin with additional broth if necessary until soup reaches desired consistency. Season to taste with salt and freshly ground pepper. Garnish with sour cream, green onions and avocado. This entry was posted in Menus, Recipes, Soup and tagged Black Bean Soup, healthy, Soup, Vegan, Vegetarian by skibootsinthekitchen. Bookmark the permalink.